"Parlez vous review?" Being ranked too highly in Google search results can cost you money in French courts. A judge ruled that blogger Caroline Doudet’s scathing review of restaurant II Giardino was too prominent (fourth-ranked result) and has to be changed. He also ordered Doudet to pay damages to the restaurant and legal costs. If you just can't get enough of yourself, you gotta have the Burnt Impressions customizable toaster. Just send a picture of yourself (and $75) to the company and they’ll send you a toaster that will burn your selfie into every slice. Google Street View cars are now equipped with natural gas sensors, enabling them to map gas leaks from corroding pipes and fast food restaurants. Just don’t ask what else they’re tracking. New York City’s 7,300 payphone stations will be replaced with free WiFi hotspots if the city has its way. Google was among 50 companies attending a “pre-proposal” meeting with city authorities to discuss how to accomplish this mission. A newspaper reporter named Clark Kent expressed vehement disapproval of the project. The Coolest Cooler not only keeps things cold, it recharges your mobile devices via USB, streams music up to 30 feet via Bluetooth, and has a built-in rechargeable blender. Oh, and it has a built-in bottle opener just like your Grandpa’s cooler had. Battle of the blogs: any bottlenecks in the flow of Netflix traffic to Verizon’s Los Angeles customers is due to the inadequate interconnection infrastructure of “middleman” networks like Level 3, according to Verizon’s VP of Regulatory Affairs, David Young, on his company blog. But Level 3’s VP of Content and Media, Mark Taylor, says it’s because Verizon is too cheap to buy a router and 4-port Ethernet card. So there. Placebo Effect: So-called “affective apps” collect physiological data through sensors, make inferences about your stress level, and provide biofeedback intended to help you relax. Researchers find that people believe an affective app knows their stress level better than they do even when it’s disconnected from its sensors and fed random data. Microsoft will lay off up to 18,000 employees in the biggest pink slip party ever thrown. Most of the decapitations will occur in the Nokia mobile phone business that Microsoft acquired earlier this year. “Project Zero” is Google’s new initiative to reduce the number of people victimized by “zero-day” security vulnerabilities. The company is hiring security researchers, who are typically moonlighters, to work full time and without distractions at what they love. If you can control software through Google Glass using just your mind, then software can read your mind through Google Glass. That conspiracy theory is laid to rest in this exhaustive but straightforward deconstruction of how “thought-control” apps really work. "Nobody leaves the family…" Comcast’s new spokesperson should be the “Overly Attached Girlfriend” meme, apparently. The cable giant actually issued a statement saying it is “very embarrassed” by this account of a canceling customer’s debate with an overly-zealous customer retention rep. I've already read your mind, and some of your comments are really interesting. Please post them here for other readers to enjoy! Most recent comments on "Geekly Update - 23 July 2014"
This guy wanting to cancel the account is very cool and his method really is the best way to handle such encounters with Customer Service Reps.
Getting ticked off and p*ssed off to the point where you end up cussing them out just leads nowhere, results are not productive and the customer loses each time. I go two steps further and transcribe the event taking names/dates/notes along with addressing CR with their first name and also treating them as if they were a consumer rather than a worker for some %^&* company. If I am not successful, the next call to the company usually results in better offers or simpler termination experience. And you don’t end up being all frayed after the conversation. This is disgraceful on the part of the rep, and I suspect he's had similar conversations with other customers, but they didn't make the news. Ryan was overly generous in asking that he not be fired. AOL used to do something similar years ago, but not with such intensity. 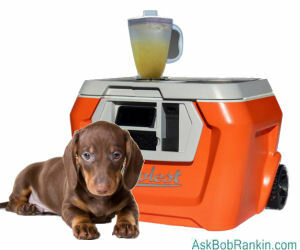 "The Coolest Cooler not only keeps things cold, it recharges your mobile devices via USB, streams music up to 30 feet via Bluetooth, and has a built-in rechargeable blender. Oh, and it has a built-in bottle opener just like your Grandpa’s cooler had". Bob, since you've already read my mind, tell me what I was going to say. I hope Google does the "right thing" and hires folks loosing their jobs at Nokia, for this new "Project Zero"; well, if at all possible, that is. The cooler doesn't come with a puppy? I'm extremely disappointed! I want to second Bob's note to read up on the Verizon/Netflix kerfuffle. Especially in light of Net Neutrality - and make up your own mind whether this even is a Net Neutrality issue at all. I side with Level 3: although this may be a Net Neutrality issue (is Verizon prioritizing traffic?) it is definitely a Anti-competition issue. Verizon wants customers to not use Netflix and to instead use their own Video-on-demand service. 'Course Verizon can't say that because it would reveal their monopoly status as a ISP and cable supplier.